35005001 EX60-5 HITACHI EX60-5 Crawler excavator. Spare Parts Catalog. Service (workshop) Manual. Operator's Instruction Manual. 35005002 EX60LC-5 HITACHI EX60LC-5 Crawler excavator. Spare Parts Catalog. Service (workshop) Manual. Operator's Instruction Manual. 35005003 EX60BUN-5 HITACHI EX60BUN-5 Crawler excavator. Spare Parts Catalog. Service (workshop) Manual. Operator's Instruction Manual. 35005004 EX70LCK-5 HITACHI EX70LCK-5 Crawler excavator. Spare Parts Catalog. Service (workshop) Manual. Operator's Instruction Manual. 35005005 EX75UR-5 HITACHI EX75UR-5 Crawler excavator. Spare Parts Catalog. Service (workshop) Manual. Operator's Instruction Manual. 35005006 EX75URT-5 HITACHI EX75URT-5 Crawler excavator. Spare Parts Catalog. Service (workshop) Manual. Operator's Instruction Manual. 35005007 EX75US-5 HITACHI EX75US-5 Crawler excavator. Spare Parts Catalog. Service (workshop) Manual. Operator's Instruction Manual. 35005008 EX80-5 HITACHI EX80-5 Crawler excavator. Spare Parts Catalog. Service (workshop) Manual. Operator's Instruction Manual. 35005009 EX100-5 HITACHI EX100-5 Crawler excavator. Spare Parts Catalog. Service (workshop) Manual. Operator's Instruction Manual. 35005010 EX100-5E HITACHI EX100-5E Crawler excavator. Spare Parts Catalog. Service (workshop) Manual. Operator's Instruction Manual. 35005011 EX100M-5 HITACHI EX100M-5 Crawler excavator. Spare Parts Catalog. Service (workshop) Manual. Operator's Instruction Manual. 35005012 EX110-5 HITACHI EX110-5 Crawler excavator. Spare Parts Catalog. Service (workshop) Manual. Operator's Instruction Manual. 35005013 EX110M-5 HITACHI EX110M-5 Crawler excavator. Spare Parts Catalog. Service (workshop) Manual. Operator's Instruction Manual. 35005018 EX120-5X HITACHI EX120-5X Crawler excavator. Spare Parts Catalog. Service (workshop) Manual. Operator's Instruction Manual. 35005021 EX120-5 HITACHI EX120-5 Crawler excavator. Spare Parts Catalog. Service (workshop) Manual. Operator's Instruction Manual. 35005025 EX130H-5 HITACHI EX130H-5 Crawler excavator. Spare Parts Catalog. Service (workshop) Manual. Operator's Instruction Manual. 35005026 EX135UR-5 HITACHI EX135UR-5 Crawler excavator. Spare Parts Catalog. Service (workshop) Manual. Operator's Instruction Manual. 35005027 EX135US-5 HITACHI EX135US-5 Crawler excavator. Spare Parts Catalog. Service (workshop) Manual. Operator's Instruction Manual. 35005028 EX140US-5 HITACHI EX140US-5 Crawler excavator. Spare Parts Catalog. Service (workshop) Manual. Operator's Instruction Manual. 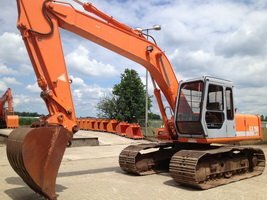 35005029 EX150LC-5 HITACHI EX150LC-5 Crawler excavator. Spare Parts Catalog. Service (workshop) Manual. Operator's Instruction Manual. 35005030 EX160LC-5 HITACHI EX160LC-5 Crawler excavator. Spare Parts Catalog. Service (workshop) Manual. Operator's Instruction Manual. 35005031 EX200-5 Forester HITACHI EX200-5 Forester Crawler excavator. Spare Parts Catalog. Service (workshop) Manual. Operator's Instruction Manual. 35005036 EX200-5 HITACHI EX200-5 Crawler excavator. Spare Parts Catalog. Service (workshop) Manual. Operator's Instruction Manual. 35005042 EX200LC-5 HITACHI EX200LC-5 Crawler excavator. Spare Parts Catalog. Service (workshop) Manual. Operator's Instruction Manual. 35005047 EX210H-5 HITACHI EX210H-5 Crawler excavator. Spare Parts Catalog. Service (workshop) Manual. Operator's Instruction Manual. 35005048 EX210LCH-5 HITACHI EX210LCH-5 Crawler excavator. Spare Parts Catalog. Service (workshop) Manual. Operator's Instruction Manual. 35005051 EX220-5 HITACHI EX220-5 Crawler excavator. Spare Parts Catalog. Service (workshop) Manual. Operator's Instruction Manual. 35005053 EX220LC-5 HITACHI EX220LC-5 Crawler excavator. Spare Parts Catalog. Service (workshop) Manual. Operator's Instruction Manual. 35005055 EX230H-5 HITACHI EX230H-5 Crawler excavator. Spare Parts Catalog. Service (workshop) Manual. Operator's Instruction Manual. 35005056 EX230K-5 HITACHI EX230K-5 Crawler excavator. Spare Parts Catalog. Service (workshop) Manual. Operator's Instruction Manual. 35005057 EX230LC-5 HITACHI EX230LC-5 Crawler excavator. Spare Parts Catalog. Service (workshop) Manual. Operator's Instruction Manual. 35005059 EX230LCH-5 HITACHI EX230LCH-5 Crawler excavator. Spare Parts Catalog. Service (workshop) Manual. Operator's Instruction Manual. 35005060 EX230LCK-5 HITACHI EX230LCK-5 Crawler excavator. Spare Parts Catalog. Service (workshop) Manual. Operator's Instruction Manual. 35005061 EX270-5 HITACHI EX270-5 Crawler excavator. Spare Parts Catalog. Service (workshop) Manual. Operator's Instruction Manual. 35005062 EX270LC-5 HITACHI EX270LC-5 Crawler excavator. Spare Parts Catalog. Service (workshop) Manual. Operator's Instruction Manual. 35005063 EX280H-5 HITACHI EX280H-5 Crawler excavator. Spare Parts Catalog. Service (workshop) Manual. Operator's Instruction Manual. 35005064 EX280LCH-5 HITACHI EX280LCH-5 Crawler excavator. Spare Parts Catalog. Service (workshop) Manual. Operator's Instruction Manual. 35005065 EX300-5 HITACHI EX300-5 Crawler excavator. Spare Parts Catalog. Service (workshop) Manual. Operator's Instruction Manual. 35005066 EX300-5HHE HITACHI EX300-5HHE Crawler excavator. Spare Parts Catalog. Service (workshop) Manual. Operator's Instruction Manual. 35005067 EX330LC-5 Forester HITACHI EX330LC-5 Forester Crawler excavator. Spare Parts Catalog. Service (workshop) Manual. Operator's Instruction Manual. 35005068 EX300LC-5 HITACHI EX300LC-5 Crawler excavator. Spare Parts Catalog. Service (workshop) Manual. Operator's Instruction Manual. 35005070 EX330LC-5 HITACHI EX330LC-5 Crawler excavator. Spare Parts Catalog. Service (workshop) Manual. Operator's Instruction Manual. 35005071 EX350H-5 HITACHI EX350H-5 Crawler excavator. Spare Parts Catalog. Service (workshop) Manual. Operator's Instruction Manual. 35005072 EX350H-5HHE HITACHI EX350H-5HHE Crawler excavator. Spare Parts Catalog. Service (workshop) Manual. Operator's Instruction Manual. 35005073 EX350K-5 HITACHI EX350K-5 Crawler excavator. Spare Parts Catalog. Service (workshop) Manual. Operator's Instruction Manual. 35005074 EX350LCH-5 HITACHI EX350LCH-5 Crawler excavator. Spare Parts Catalog. Service (workshop) Manual. Operator's Instruction Manual. 35005075 EX370-5 Forester HITACHI EX370-5 Forester Crawler excavator. Spare Parts Catalog. Service (workshop) Manual. Operator's Instruction Manual. 35005076 EX370-5M HITACHI EX370-5M Crawler excavator. Spare Parts Catalog. Service (workshop) Manual. Operator's Instruction Manual. 35005078 EX370-5 HITACHI EX370-5 Crawler excavator. Spare Parts Catalog. Service (workshop) Manual. Operator's Instruction Manual. 35005079 EX370HD-5 HITACHI EX370HD-5 Crawler excavator. Spare Parts Catalog. Service (workshop) Manual. Operator's Instruction Manual. 35005080 EX400-5 HITACHI EX400-5 Crawler excavator. Spare Parts Catalog. Service (workshop) Manual. Operator's Instruction Manual. 35005081 EX400LC-5 HITACHI EX400LC-5 Crawler excavator. Spare Parts Catalog. Service (workshop) Manual. Operator's Instruction Manual. 35005082 EX450H-5 HITACHI EX450H-5 Crawler excavator. Spare Parts Catalog. Service (workshop) Manual. Operator's Instruction Manual. 35005083 EX450MTH-5 HITACHI EX450MTH-5 Crawler excavator. Spare Parts Catalog. Service (workshop) Manual. Operator's Instruction Manual. 35005084 EX450LC-5 HITACHI EX450LC-5 Crawler excavator. Spare Parts Catalog. Service (workshop) Manual. Operator's Instruction Manual. 35005085 EX450LCH-5 HITACHI EX450LCH-5 Crawler excavator. Spare Parts Catalog. Service (workshop) Manual. Operator's Instruction Manual. 35005087 EX550-5 HITACHI EX550-5 Crawler excavator. Spare Parts Catalog. Service (workshop) Manual. Operator's Instruction Manual. 35005088 EX550LC-5 HITACHI EX550LC-5 Crawler excavator. Spare Parts Catalog. Service (workshop) Manual. Operator's Instruction Manual. 35005090 EX600H-5 HITACHI EX600H-5 Crawler excavator. Spare Parts Catalog. Service (workshop) Manual. Operator's Instruction Manual. 35005092 EX750-5 HITACHI EX750-5 Crawler excavator. Spare Parts Catalog. Service (workshop) Manual. Operator's Instruction Manual. 35005094 EX800H-5 HITACHI EX800H-5 Crawler excavator. Spare Parts Catalog. Service (workshop) Manual. Operator's Instruction Manual. 35005096 EX1200-5 HITACHI EX1200-5 Crawler excavator. Spare Parts Catalog. Service (workshop) Manual. Operator's Instruction Manual. 35005097 EX1200-5C HITACHI EX1200-5C Crawler excavator. Spare Parts Catalog. Service (workshop) Manual. Operator's Instruction Manual. 35005098 EX1200-5D HITACHI EX1200-5D Crawler excavator. Spare Parts Catalog. Service (workshop) Manual. Operator's Instruction Manual. 35005099 EX1900-5 HITACHI EX1900-5 Crawler excavator. Spare Parts Catalog. Service (workshop) Manual. Operator's Instruction Manual. 35005100 EX2500-5 HITACHI EX2500-5 Crawler excavator. Spare Parts Catalog. Service (workshop) Manual. Operator's Instruction Manual. 35005101 EX3600-5 HITACHI EX3600-5 Crawler excavator. Spare Parts Catalog. Service (workshop) Manual. Operator's Instruction Manual. 35005102 EX5500-5 HITACHI EX5500-5 Crawler excavator. Spare Parts Catalog. Service (workshop) Manual. Operator's Instruction Manual.